When a car plowed into pedestrians outside London’s Natural History Museum last week, passerby presumed a terrorist attack was taking place. 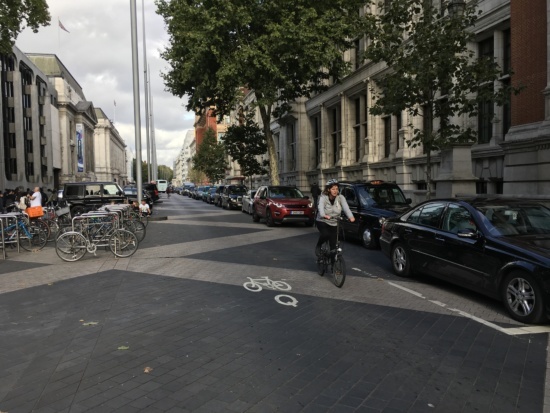 It turned out to be bad driving, but the incident has raised serious debate about the innovative design of Exhibition Road, which runs through the heart of the museum quarter. In the United Kingdom, Exhibition Road is the most significant example of shared space as espoused by the influential Dutch traffic engineer Hans Monderman. According to Monderman, the removal of traffic lights and road signs creates a level of ambiguity that slows cars down and increases the interaction between the different modes of travel. A decade or so ago, Monderman’s theories were taken up with enthusiasm by Daniel Moylan, a Councillor in the Royal Borough of Kensington and Chelsea in which Exhibition Road is located. Moylan – a rare example of a politician with a real understanding of design – hired architects Dixon Jones, whose landscaping of the courtyard of the 18th century Somerset House had received critical acclaim, to redesign Exhibition Road according to the Dutchman’s principles. The wide boulevard forms the spine of ‘Albertopolis’, the cultural and education quarter developed after the 1851 Great Exhibition masterminded by Prince Albert, the husband of Queen Victoria. It links South Kensington Underground Station in the south with Hyde Park in the north. In addition to the Natural History Museum, it is flanked by the Victoria and Albert Museum (V&A), the Science Museum, Imperial College, the Goethe Institute and the Royal Geographical Society. It was once a busy four-lane route with parking on either side as well as in the center. Moylan’s vision was to provide a better ‘front door’ for the key institutions and to deliver this in time for the London Olympics in 2012. The computer-generated images of Dixon Jones’s design suggested that the marathon route would be diverted to take in this new piece of placemaking. However, the well-heeled local residents were not so sanguine about this idea. They were concerned about reduced access for their SUVs and Range Rovers and mad about the loss of parking space. So compromises were made. The cleared space was re-designed to include parking and pedestrians were pushed to one side of the street, leaving a long and straight avenue that invited drivers to put their foot to the pedal. While the quality of place was massively improved by the changes overall, the stretch of road between the Natural History Museum and the V&A never worked in the way it was originally intended. The levels of ambiguity`so essential to Monderman’s approach had been lost. However, at the south end of the street, which curves around to link up with South Kensington Underground station, a more complex road pattern slows drivers down and they intermingle safely with pedestrians and cyclists. Restaurants have colonized the street with chairs and tables and diners sit happily amidst the passing traffic. I walked around the area with architect Ed Jones recently. He enthused about the way the restaurateurs were using the street and pointed out how the improvements had prompted most of the institutions to give their own premises a facelift, the most significant of which is Amanda Levete’s spectacular new entrance and courtyard for the V&A. 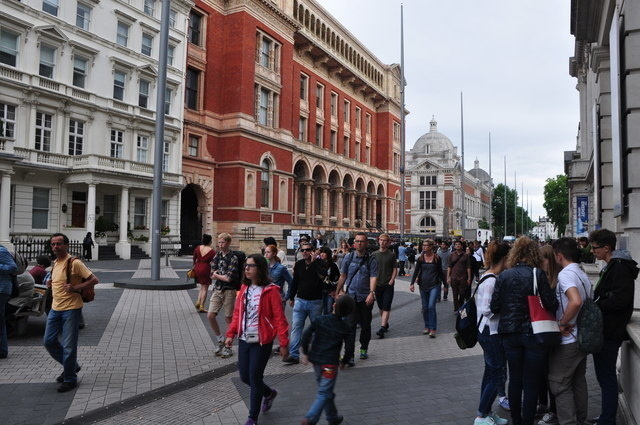 Following the recent accident, which left 11 people hospitalized, V&A director Tristram Hunt described the traffic arrangements on Exhibition Road as “confusing, dangerous and unsatisfactory” and called for the street to be fully pedestrianized. 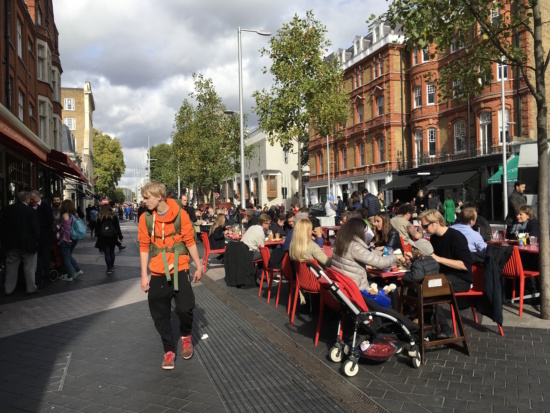 While it is clear that Dixon Jones’ design needs amending to reduce traffic speeds and to let drivers know that they do not have a clear right of way, full pedestrianization is not the answer. Monderman’s theories have been given greater relevance through research carried out by Peter Jones, Professor of Transport and Sustainable Development at University College London. Jones has defined a hierarchy of streets and roads depending on their levels of movement and their contribution to placemaking. It is a theory more relevant to the complex street layouts of English cities than the grids of North America and has been taken up by the transit authority, Transport for London, which has created a matrix of nine street types ranging from arterial roads (high movement/low quality of place) to city squares (low movement/high quality of place). Most streets in London have now been categorized in this way, allowing coordinated decisions on the infrastructure required for each condition. Designed well, shared space works and makes good use of space in a crowded city. One of the best examples is Leonard’s Circus in the Borough of Hackney which was, until two years ago, a busy junction. It is now an open square with landscaping through which trucks, cars, cyclists and pedestrians wend their way. So safe does it feel that street vendors – with large lunchtime queues – set up in the space undeterred by the vehicles passing through. Exhibition Road is too big a space for pedestrians alone. Without vehicles, large sections of it will be dead even during the day; at night it will be worse. My message to those who want to close the road to vehicular traffic is to push for speed limits, educate taxi drivers (who are some of the worst culprits) and continue to allow all road users to intermingle in and share this great civic space.